I’m not the type of person who counts Michelin stars but I do think the Michelin guide is a good guide to use and I often check out restaurants mentioned in it when I’m going travelling, especially when I want to go to a more up-scale restaurant. 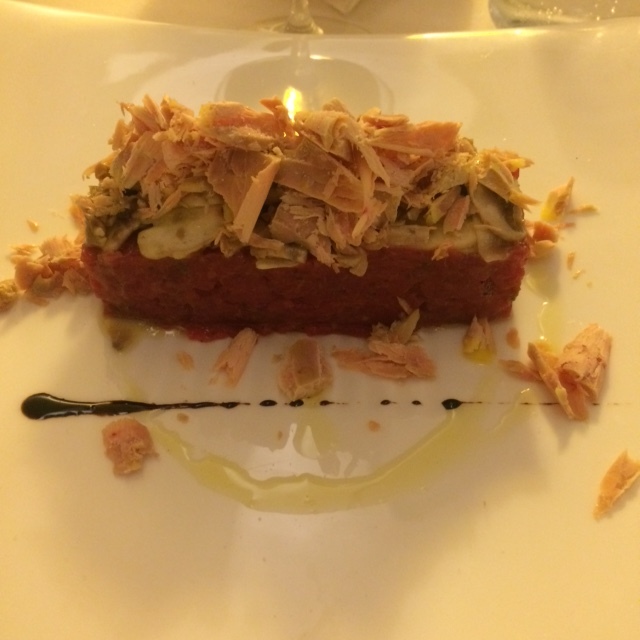 I did my research before Rome as well and the Michelin star restaurant I was most excited to try, Glass, was fully booked the one night I had in the city. Luckily my next choice, Antico Arco in Trastevere had availability. Despite having dinner here on my own on a Saturday night, I had a fabulous meal and really enjoyed the food, the ambiance and the service. I actually think I got the most attention from the staff, checking I was enjoying myself as often as they could. 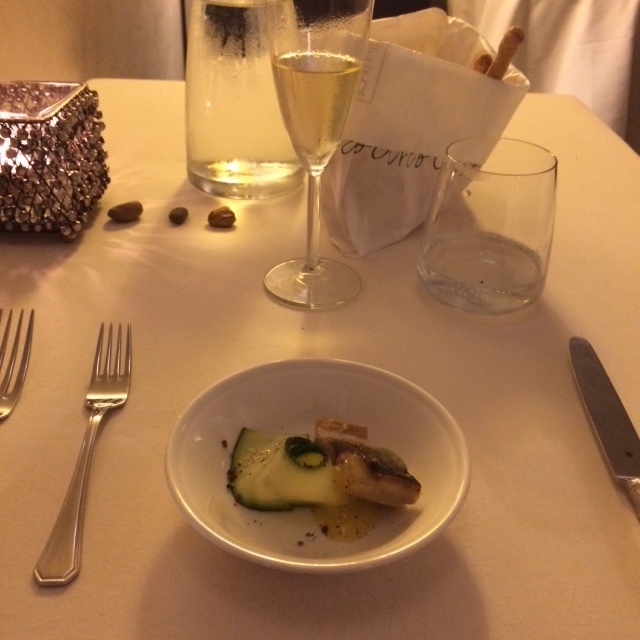 My lovely meal started with an amuse bouche (pictured above) of crispy mackerel, courgette and a very light orange sauce. So delicious! 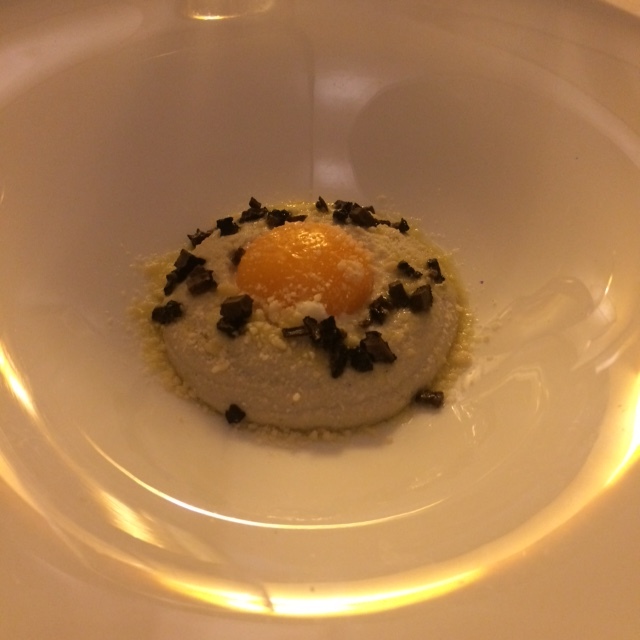 My choice of starter was a porcini mushroom mousse with yoghurt, poached egg yolk and blac truffle. So very good! 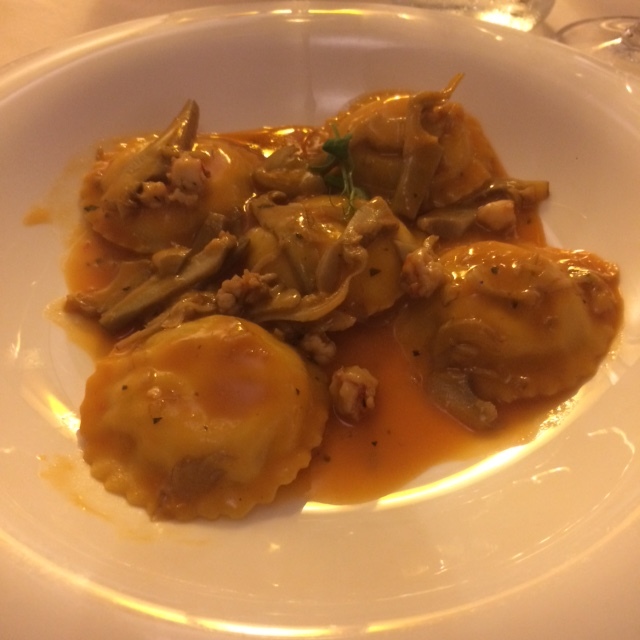 Next up was a pasta dish; ravioli with sea bass with a seafood bisque. The pasta itself was amazingly thin and delicious, the bisque nice and pungent and the seabass nice and soft, but it wasn’t really what I had expected texture wise. For my maincourse I was choosing between three meat dishes and since one of the waiters recommended the steak tartare I went for that. It was the most decadent steak tartare I’ve ever seen; a ginormous portion of perfectly seasoned raw steak, topped with raw porcini mushrooms, black truffle and generous shavings of foie gras. It was delicious and very rich, and having had two courses already there was no way I would get close to even finish it. 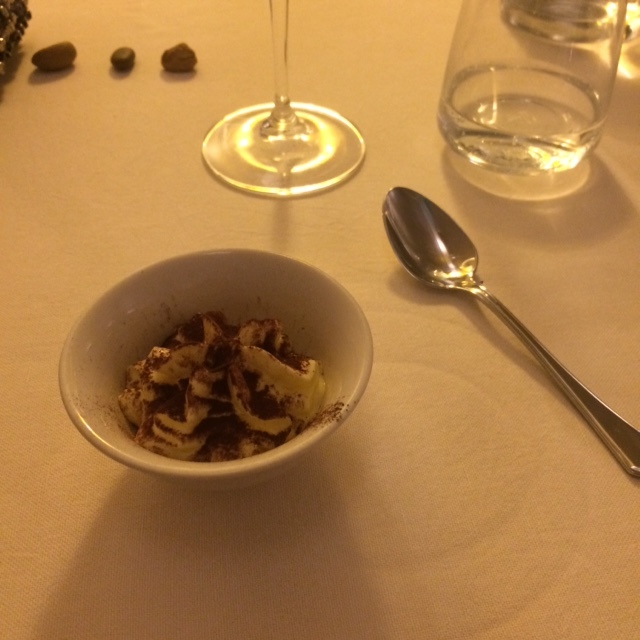 I was so full after my lovely meal I declined pudding (no room) but the waiters still brough me a mini dessert of decaf tiramisu. It was heavenly but I couldn’t even finish that tiny portion. Instead I had a tea and a breather, and looking around the fellow guests I was wondering how they manage to finish their portions. I mean, to me, Roman portions were American sized. Turns out they order differently to me. A couple near me had several mini plates of soup and pasta before having a main course each. I guess I’m too polite to even consider asking for tasting portions in a nice restaurant, but the next day I did so at lunch. And it turns out even a half portion of pasta is large, but at least I could finish it!